Where to go in the Elqui Valley? Lying 528 km from Santiago, this town stands on the upper reaches of the Elqui or Coquimbo river, at about 700 meters above sea level; this, combined with its mediterranean climate and a good supply of water, has permitted the development of a rich and varied agriculture. The town is located about 60 km east of La Serena, with which it has been connected by a railway line since 1885. It was founded by Joaquin Vicuña with the name of San Isidro de Vicuña. It is the birthplace of Gabriela Mistral, and the museum which bears her name is the most characteristic cultural feature of the town. 37 km south of Vicuña and 109 km from La Serena, we reach Pisco Elqui (a composite name associated with the Quechua pisko, meaning bird, and elki, meaning thin or reduced). This village sits on a hill with some streets which wind and others which run straight up towards a mountain. There are good hotels, restaurants and campsites; and a variety of traditional handicrafts are available for sale. The town of Monte Grande lies 93 km from La Serena and 31 km from Vicuña; it belongs to the municipality of Paihuano. The town boasts a beautiful church with a high wooden bell-tower. Gabriela Mistral grew up in the Casa Escuela y Correo (Schoolhouse and Post Office) which is now a National Monument. There, as a child, she received her education from her sister, who was a teacher and the head of the post office. This valley is considered to a have great mystic value and is renowned as a center for meditation. An 18 km dirt road, which follows the twists and turns of the Cochiguaz river, opens up a beautiful landscape of towering deserted hillsides and cactus- covered mountains. Located 11 km from the city of La Serena and 51 km from Vicuña, this small town consists of characteristic fruit farms and orchards, with a beautiful square and church built in adobe. Above the town lies the cemetery, which is one of the oldest in Chile. An old rural town, 23 km from La Serena, Las Rojas boasts a beautiful church made of adobe dating from 1892. Its inhabitants mainly live from agriculture. The countryside is adorned with a variety of aromatic fruit trees. El Molle is an attractive village lying 34 km from La Serena and 28 km from Vicuña. It was a cradle of pre-Hispanic civilization, and the first archaeological traces of a pre-Diaguitas culture, known as the Molle culture, were found here. A great feature of this village is the large houses of the farmers, and the visitor can savor the typical cuisine and baking, especially fig and papaya jams, quince jams and cheeses, and manjar, a sweet caramel spread, as well as home-baked bread. The village also has restaurants, and picnic and recreation areas. It is easily reached via Ruta 41, which is the only access to the town for the numerous visitors. 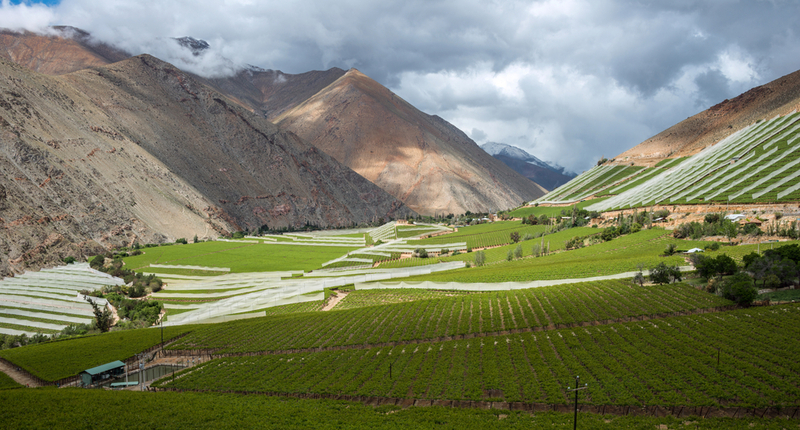 Surrounded by hills and vineyards, this town lies 7 km west of Vicuña. The streets are narrow, and opposite the main square is the church, also built of adobe. This was one of the first churches to be established in the Elqui Valley and is famous for its bells, which are cast in gold and ring with a very special sound. San Isidro is a very old town of indian origins, which lies 3 km northwest of Vicuña. The access road is in good condition. The main attraction of the town is its church, with traces of colonial brickwork visible in the interior. In the month of May the fiesta de San Isidro is celebrated in honor of the patron saint of agriculture. Situated 5 km from Vicuña, this is one of the most important towns of the Elqui Valley, since it preserves its characteristic structure grouped around the main street, where the old church made of adobe is of particular interest. Peralillo is also an important producer of grapes for the pisco production of the area. On the road to the town, which runs along the banks of the Elqui river, you pass the “Capel” pisco producers’ co-operative. Here it is possible to see and taste the production process of pisco. Diaguitas is a typical town of the Elqui Valley. Of particular interest are the church and main square, with their classical architecture. Lying 27 km from La Serena, Quebrada de Talca is an ideal place for direct observation of the skies of the Elqui Valley. Access to the area is easy and safe. The site is reached just past the small hamlet of Quebrada de Talca and its altitude is about 450 meters above sea level, with capacity for about 50 vehicles. 41 km from La Serena is one of the most important engineering works of the area. The Puclaro reservoir has a capacity of 200 million cubic meters of water and a surface area of 760 hectares. This site was opened on October 27th 1999 by the President of Chile, Eduardo Frei Ruiz-Tagle. Situated 83 km from La Serena and 9 km from Paihuano, at the confluence of the rivers Elqui, Turbio and Claro. The visitor can continue towards the international pass at Agua Negra or turn south towards Paihuano. 13 km from Rivadavia lies the town of Chapilca, known for its traditional weavings. 30 km from Vicuña and 9 km from Rivadavia, at an altitude of 979 meters above sea level, Paihuano is the capital of its municipality and was founded on October 22nd 1891.